After the heatwave and droughts of last summer, lush green lawns all around the country turned into baron, dusty patches. However, believe it or not and contrary to popular belief, this wasn’t the grass dying but it was in fact the grass going into a state of dormancy to protect itself, allowing the grass to focus its energy on keeping the roots alive. Using a rake, remove the loose material from the grass and give it a generous water. If the ground is hard, use an aerator or garden fork to create holes into the ground to help aid water absorption. The amount of water you use is dependent on how much rain fall you have had. If a hose pipe ban has been in place, check your local council website for more information. Having problem with patches on your lawn? 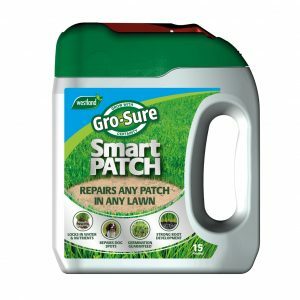 During Spring when the temperatures are getting warmer, fix any patches using Gro-Sure Smart Patch. It contains water retaining granules and is guaranteed to repair any patch in your lawn. 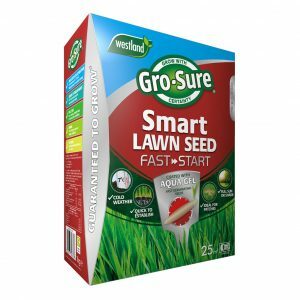 If your entire lawn still needs to be revitalised, use Gro-Sure Smart Lawn Seed. It contains a clever aqua gel coating that can absorb 400 times its weight in water to guarantee germination so it is perfect for over-seeding worn grass or filling in any large areas of bare patches. To help gardeners get ahead before the start of the growing season, Gro-Sure Fast Start lawn Seed has been developed to be used much earlier in the season. Most lawn seeds germinate when the soil temperature is 10°C degrees, but Gro-Sure Fast Start begins working at 7°C meaning you can sow your lawn seed even when ground temperatures are low. Three to four weeks after seeding, apply a balanced fertiliser to replenish soil nutrients and give at an extra boost to keep the lawn strong and healthy. 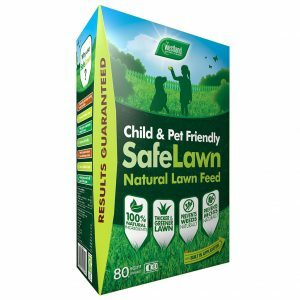 Westland SafeLawn releases nutrients gradually to avoid stress and includes grass seed to fill thinning areas. It is an organic fertiliser with added lawn seed and has been made using only natural ingredients. Furthermore, it is safe to use around pets and children making it a suitable product to use by many families. If you have done all of the above and your lawn is still looking dead, simply give the grass a gentle pull and if you can easily pull it up then unfortunately your grass has died. However, if you face some resistance then it is still alive and there is still hope for recovery! If your lawn hasn’t recovered and has died you will need to sow a new lawn. The autumn after a dry summer is the ideal time to carry out repairs to your lawn. This will give your lawn enough time to recover from the drought but will also help to make it more drought resistant the following year. Gro-Sure Smart Lawn Seed is a perfect product for sowing your new lawn, as not only does it contain grass seed but it also helps to prevent future damage to your lawn if a dry spell was to occur again. Make sure that you remove any dead parts of the lawn before you start to sow as it is important to scatter the lawn seed over bare soil. A key point to remember is that grass is one of the most resilient plants on earth. If a drought does occur again, simply leave the grass well alone and don’t mow your grass or use any lawn care products. If you’re lucky your lawn will usually recover rapidly with renewed rainfall after the drought. If not, simply wait until the heat wave passes and begin your lawn care routine again.